When it was created, Music Fund was the result of an unusual synergy between Oxfam Solidarity and the music ensemble Ictus. Since 2002 Ictus has regularly been sending musicians to music schools in Palestine, Israel and Mozambique. While he was on a mission in Palestine, Lukas Pairon, general director of Ictus, realised that the musicians there worked in difficult conditions and that there was an urgent need for musical instruments. The idea of organising campaigns to collect instruments emerged. In 2005, up to 500 instruments of all kinds were received with the support of Oxfam-Solidariteit. The first shipment to Palestine and Israel took place around the end of the same year. 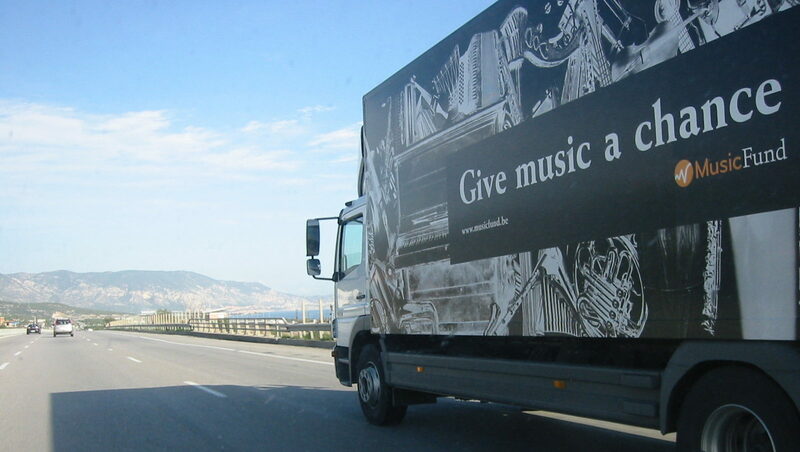 The lorries carrying the musical instruments out of Belgium displayed our creed: “Give Music a Chance”. Other shipments to the Middle-East and to Africa soon followed. But it was felt necessary to go one step further in order to turn these donations into sustainable projects. This is why we set up training programmes for musical instrument repair technicians, giving partner organisations the capacity to maintain their instruments by themselves. The objective was to allow our partners to build a professional know-how. Music Fund has in the meantime developed and expanded, and is now an organisation with 3 part-time employees and a large number of part-time workers and voluntary workers in Belgium and abroad. Beside the administrative office in Brussels, there is also a workshop in Marche-en-Famenne, where instruments are repaired, and an instrument storage facility in Jemelle. In 2010, the European Commission selected Music Fund as “Best Practice in Culture and Development”. We understand that music education and music playing alone do not prevent conflict, nor do they promote economic development. However, our experience is that well-structured music teaching can play a role in building or rebuilding a community, because the attention is focused on culture, and thus away from the misery of war and poverty. In these regions, young people with no perspective of a better future could easily think they can improve their situation by taking part in the ongoing conflict or in criminal activities. Music learning and playing offer another way, because these activities require concentration, discipline, dialogue, the ability to abide by rules and to reach agreements with others, all of which is possible through new encounters. The need for artistic expression does not prevail over the satisfying of basic needs like food, safety and health. Still, we are convinced that having the possibility of creative opportunities, for onself and one’s children, through music gives a strong feeling of being a human being and does not limit oneself to meeting these basic needs and daily challenges. We don’t want to “help” our partners, but to support them so that they become more autonomous, through the donations of musical instruments, tools to maintain and repair these and spare parts, without losing sight of the know-how to use them. The partner organisations indicate what they want to achieve with Music Fund. We have made a conscious choice to limit our activities and to focus our interventions on the need for musical instruments and repair technicians. That is why it is very important to us to work with a limited number of partner schools, so that we can ensure direct, personal and long-term relations. Music Fund not ony sends out experts to support projects, but also capitalises on the intercultural experience of its experts, who often come back with an enormous knowledge and rich experience. Another of our goals is to forge ties between the initial instrument owners and the final players, thanks to our database that allows a donor to follow the new life of his/her instrument. Music Fund supports organisations in its own country that offer music classes or set up musical projects with/for socially vulnerable people. We try as much as possible to remove the financial barrier that prevents these people from taking actively part to musical activities, i.e. the money to buy an instrument.